Psychologist Erikson talks about various psycho-social development in human that affect the growth and development of an individual. The adolescent period, between the ages of approximately 12 to 18 or 21, is a critical period of transition too (Janetius, 2015). Teens need to develop a sense of self and personal identity by exploring their independence and develop a sense of self. Erikson also believes that peers have a strong impact on the development of ego identity during adolescence. He reiterates that association with negative peer groups such as goal-less and aimless youth will hinder the developing ego during this delicate period. Those who emerge from the adolescent stage of personality development with a strong sense of identity are well equipped to face adulthood with confidence and certainty. This is the case study of an adolescent, who refused to write the Higher Secondary Exam. Abstract: The word entrepreneurship derives from the French word entreprendre, which means, to undertake. Generally, an entrepreneur is a person who initiates a business and runs a business or one who work for himself /herself rather than an employee of another company. An entrepreneur requires capital money for setting up, successful operation, regular up-gradation and modernization of the business. Both the Central and State governments have been taking a number of steps, by formulating various policies and schemes, for the promotion and development of small and medium enterprises. However, no much initiative comes from young adults to become entrepreneurs. It is ideal to conceive such initiatives while young people are at colleges or while they complete their college education. This study focuses on the various factors that affect the development of entrepreneurship among rural college students. A survey was taken among rural college students in and around Pollachi, to identify the various reasons behind the lack initiatives. Further, the study also evaluates the various initiatives taken by colleges in motivating young rural adults to become entrepreneurs. Human resources are the people in organizations and human resource management (HRM) is the personnel management with a concept that employees are an asset to the business. Therefore, employees are referred to today as human capital. The effective management of this asset is to do business with an effective use of employees, reducing risk and maximizing outcome. The objective of HRM is responsible for performing the task of achieving the goals and objectives by handling the personnel related aspects of an organization, namely, recruitment, propose rewards and incentives to attract talents, training for performance and professional development, evaluation and appraisal for promotion, payroll management, conflict resolving and maintaining legal issues. The study uses both archival studies and a sample survey to collect data on the current HRM practices. 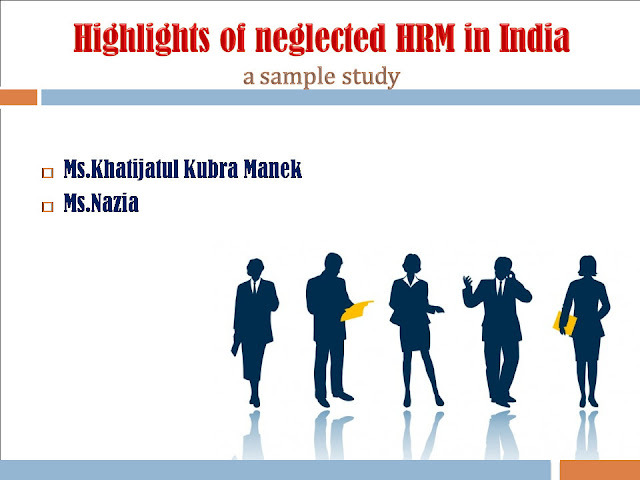 Through archival studies, the study highlights the HRM practices of highly acclaimed organizations around the globe and from the sample survey data, identifies the neglected HRM practices in India. Organizational DNA (OrgDNA) refers to the vision – mission, culture, structure and functionality of an organization. This gives an organization a unique identity that set apart the organisation from others. Organizations with a sick DNA will have poor concern for its own employees and do not anticipate and adopt innovative changes as per the needs of the time, fail to attract quality stakeholders resulting into high rate of employee attrition, employee dissatisfaction and dropouts. Generally employees assess an organization on the basis of mere sugar-coated vision-mission statement or attractive structures and eye-capturing advertisements realise at a later stage that they feel deceived and misled when they join such organisations. Also, many people don’t care about the OrgDNA and just work for earning money without much commitment and dedication. It is a herculean task for employees to identify quality institutions where professional development and full life-satisfaction could be achieved. This working paper is a longitudinal qualitative study (since 2014) taken up in South India that primarily examined the OrgDNA of private higher education institutions and recommends a simple modus operandi to identify quality institutions. As a continuation, the study currently works on simple ways of identifying OrgDNA of organisations to restructure organisations, if they need corporate genetherapy. ‘Right job for the right person’ proposed by the American psychologist Frank Parsons indicates the importance of inborn skills (aptitude) of an individual that plays a vital role in sustaining a career. The clear knowledge of various career options that would suit a person is of vital importance in choosing a job and sustaining a career; it is possible only if a person is aware of his/her aptitude and interest. There are no serious considerations given to the identification of the potency of an individual before entering into a job in the Indian scenario and people often think mistakenly that anyone can do any job without knowing the required skill sets and personal potency to perform that at job. This lack of knowledge about one’s ability to do a job is the main cause of losing potency to work, regular job-hopping, un-employability and even job-satisfaction. This lacuna is prevalent today because people are more dependent on ordinary people rather than psychologists for choosing a career which in turn lead to the shortage of dedicated and committed personnel in a particular job. 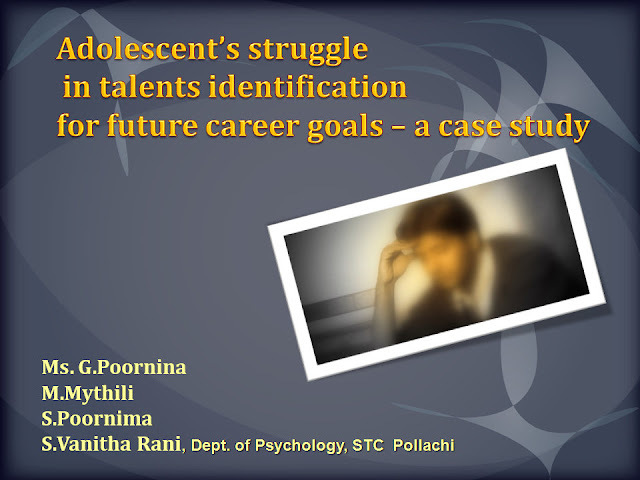 This case study depicts the background and reasons behind a young rural adult, who shifts his career now and then, and lost his interest and potency to work and the inner struggles to establish his career path. Psychological tests have become popular after World War Second era was primarily used in clinical setting to diagnose and help clients who come for therapy. Although initially used in Military recruitment, today a increasing number of organizations around the globe rely upon various psychological testing for employee selection, promotion and development. Psychological tests can guide HR Managers in identifying personalities that would fit their company and productive. Psychological testing can very well asses a prospective employee and shed insights into how well a candidate adjust and fits the culture of an organization. However, identifying the unconscious dynamics of a candidate is not very easy. Here the projective tests play a vital role. A projective test is a psychological assessment tool that comprises of ambiguous stimuli revealing hidden emotions, motives and inner conflicts of a person. The pros and cons of using projective tests are well explored in therapeutic interventions. However, it is relatively uncharted in Human Resource Field. Testing can be a valuable tool in the hiring process if a right person employs the right tests, to measure the right aspects, at the right time rather than using it to weed out people. 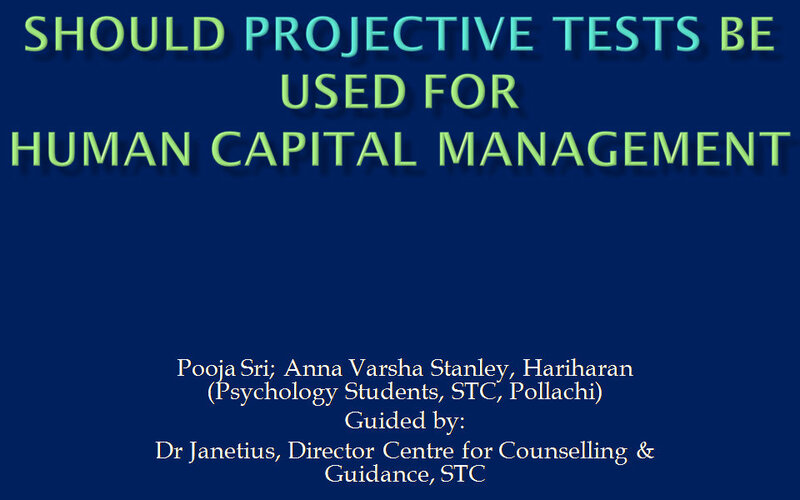 This paper sketches out the pros and cons of using various projective tests in various industrial setting to enhance Human Capital Management.